In the 1980’s the Soviet Union realized there was a direct link between alcohol consumption and many persistent social problems and health problems in the nation. There were several warning signs from studying data acquired from the previous decade, one huge one is how much money the Soviet Union made from the sales tax of alcohol. In 1979 it was 25.4 billion rubles from the sales tax of alcohol alone, more than the total gained from income tax. There was also a lot of domestic and petty crimes that were linked to alcohol, and even workplace incidents, or people just not showing up to work. So shortly after Mikhail Gorbachev gained power in 1985, he set up several measures to try and reduce alcohol consumption. One of the more famous of these measures was the law that made it illegal to buy or sell alcohol in restaurants or bars before 2:00 P.M. There was also more restrictions on what establishments were allowed to sell alcohol, and eventually the sales tax on alcohol was raised. There was even in some regions a system of “coupons” for the purchase of alcohol, with an individual only allowed so many of these coupons. These measures were actually pretty successful, there was a noticeable decline in alcohol consumption, but there were also several negative effects as well. 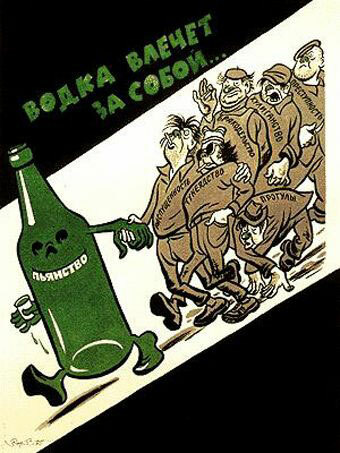 An anti-alcohol poster from 1954, Gorbachev wasn’t the only one to try and reduce alcohol consumption. Unsurprisingly these new anti-alcohol policies weren’t very popular with the general population and it mirrored several of the same negative effects as we experience here in the United States during Prohibition. An increase in organized crime dealing in alcohol, poorly set up moonshining facilities that lea to health risks for those that consume it. There was also a severe drop in how much the Soviet Union made from the sales tax of alcohol. Along with all the laws and policies that were made to reduce alcohol consumption and sale, there was also a sort of propaganda campaign against alcohol. The Soviet Union tried to educate the masses on the health risks of alcohol and how what sort of lives alcoholics live. Posters were created, literature was made, even songs were written about trying to live life in sobriety, or the dangers of drinking. Volunteer Temperance Societies were made to try and enforce these measures on the civil level. While there were successes with the anti-alcohol campaign, it proved to be too costly for the Soviet Union with the loss of revenue from alcohol sales tax. The campaign ended up only lasting for roughly two years, from 1985 to 1987. Sean, great post! I like how you drew parallels between this movement and prohibition in the US. It’s really interesting that alcohol consumption made up such a large percentage of the economy, and that these measures only lasted around two years. Great work! Hi Sean! I really like the pictures you included in your post and I like how you made connections between the American Prohibition. What Katelyn said — I appreciate the detail of your discussion of the anti-alcohol campaign, and the comparisons with prohibition in the USA. I agree, when I first started reading your post, the first thing I thought about was the American 18th Amdenednt and the era of prohibition. You later touched on it, and the impacts. I think it is very interesting how it worked in the Soviet Union but had the negative attribute of tax loss. It is somewhat ironic how after all that, money talked and the policies would end. Hey, I really liked your post on Alcohol, a lot of people–including me–wrote about it. I really liked that you included the figures to show just how large of a part of Russia’s economy it was. I also really liked the bit about people being able to use coupons to buy alcohol because I don’t think I saw that when I was writing. This post was very interesting. Do you think that the alchol policies did more harm than good? As far as health it seems like it did not help and it hurt the economy also. 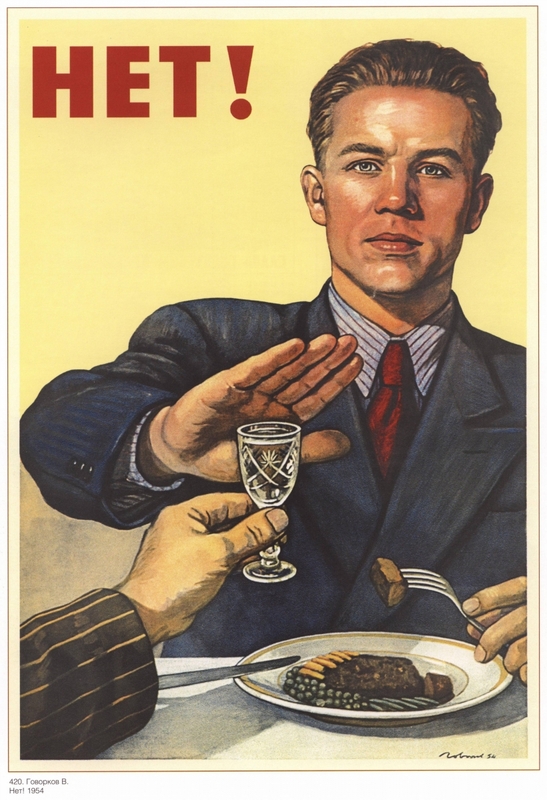 I also wrote about the anti alcohol campaign, I like the image you chose of the man rejecting alcohol because it displays how the Soviet Union utilized media to devalue the consumption of alcohol. It displays that rejecting alcohol even in a casual setting is a professional decision as an adult. I loved your use of images in supporting your writing, because it really illuminated how big the issue of alcoholism was. The cartoons really show the tone that the government was trying to set, that alcohol abuse was a serious matter and people should have self-discipline in use of it. Great post!